Orders for the superjumbo are drying up as airlines shift to more efficient planes. Airbus concedes its timing was off with the A380, which lists for $433 million but almost always sells at a discount. The financial crisis hit just as production was picking up in 2008, and soaring oil prices made airlines reluctant to buy the four-engine behemoth. The company only last year managed to start breaking even on production, and it’s acknowledged it will never recoup the €25 billion ($32 billion) it spent on development. Zafar Khan, an analyst at Société Générale, says the concern is that if production slips far below 30 planes a year, the program could fall back into the red. “The crying happens when it’s losing money,” Khan says. Axing the A380 outright is hard to do. Besides the embarrassment of admitting defeat on the program, Airbus would need to write off factories across Europe and redeploy thousands of workers. 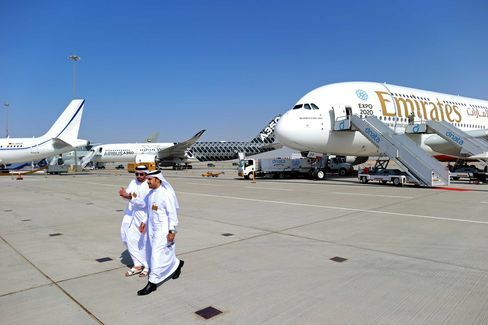 Airlines would see the resale value of their A380s plummet, and the plane’s demise would leave airports worldwide questioning the wisdom of facilities constructed to accommodate it; Dubai, for instance, built a dedicated terminal for the A380. With its short snout and upper deck crouching above the cockpit, the A380 can’t match the distinctive profile of Boeing’s humpbacked 747. Nonetheless, the A380 has largely sucked the life out of Boeing’s jumbo—perhaps the biggest Airbus success with its plane. Since 2012, when Boeing started deliveries of the latest passenger version, the 747-8, it has done far worse than the Airbus double-decker, with just 40 sold and 11 more on order. Four-engine planes have become a tough sell because of their high fuel consumption. Airbus in 2011 scrapped the A340, its other four-engine model, as carriers gravitated to smaller, more economical widebodies such as the Airbus A330 or Boeing 777; and adding more fuel-efficient engines to the A380, an upgrade Airbus has pulled off for smaller planes, remains risky with so few orders coming in. Although the A380 is popular with passengers for its spacious interior and smooth flight, carriers find it tough to fill in turbulent economic times. Malaysia Airlines learned this the hard way when, in the wake of a pair of fatal crashes involving other aircraft, it couldn’t draw enough traffic to fill the half-dozen A380s it had bought. The airline is trying to offload two of them but can’t find buyers. Lately, Airbus has seen a hemorrhaging of contracts that once seemed solid. In the past two years, three A380 customers have dropped their orders because of financial difficulties or shifts in strategy. Leasing company Amedeo three years ago announced plans to buy 20 A380s, but it’s failed to find a single airline willing to lease them and has delayed deliveries. 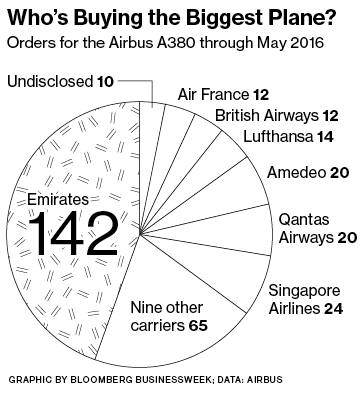 The plane’s biggest fan by far is Emirates, with 81 flying and an additional 61 reserved, which adds up to 45 percent of the A380s Airbus has delivered or has on order. The carrier is fretting about the jumbo’s future. “I think the size of the plane scares most of the airline world,” says Emirates President Tim Clark. The bottom line: A decade after the Airbus A380’s debut, its future is in doubt as airlines shift to more efficient planes.